Are you looking for the best PDF fillable form creator on the market? Being able to create interactive and fillable PDF forms is important since PDF has become the most widely used format for business documentation. To create a fillable PDF form, a powerful PDF form creator is needed. We'd like to recommend a great PDF form creator – PDFelement. Here you'll learn how to easily create PDF forms with PDFelement. To save time and energy when designing and creating a PDF form from scratch, download PDFelement to assist you. Once you've downloaded the program, click the "Create PDF" button in the Home window or go to the "Home" tab and click "From File" to load your form. Alternatively, you can click "File > New" to create a blank document. Click the "Form" tab to reveal all the interactive form field options. Click "Edit Field" to create a fillable form. Click the Form Field tool, and then move your cursor to the area on the PDF page when you want to add the interactive field. After creating an interactive field, double-click the field to reveal the properties dialogue box. From here, you can name the check box, set its appearance, colors, and its style, etc. To add text to a PDF form, go to the "Edit" tab, and click "Add Text". 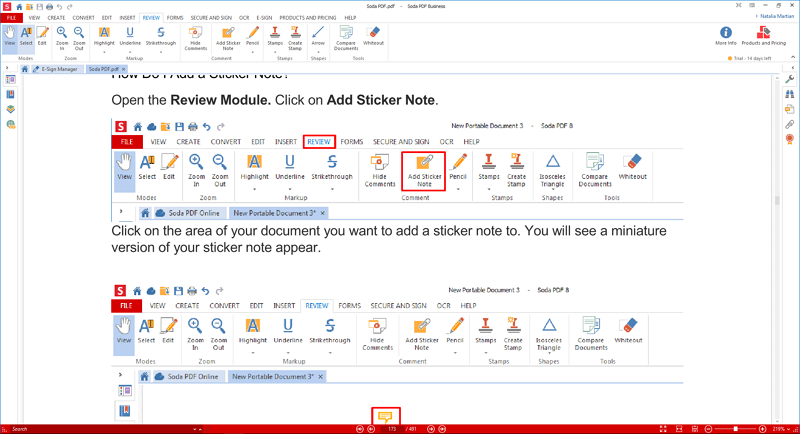 Move your cursor to the PDF form area, and click on the area where you need to insert text. After creating a PDF form, if you want to preview the fillable form, click on "Close Form Editing" in the "Form" tab first. A complete form will be displayed after you save the PDF form. You can also use Nuance Power PDF Advanced to create PDF forms. It has an intuitive interface that allows you insert checkboxes, list boxes, text fields, and radio buttons with the intent to create interactive fields. This software also lets you add e-signatures to your forms. Nuance is suitable for work and office use, and is built with a PDF converter, merger, editor, and creator. It supports different file formats like Word, Excel, Images, PowerPoint and HTML. Nuance PDF software also safeguards your privacy with its redaction tool. You can easily hide any sensitive information with this tool. An advantage of using this software is that it supports batch processing of files, and is also fast and stable to download. 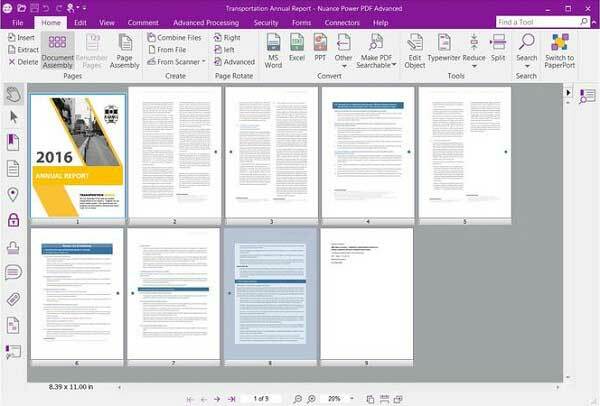 Soda PDF is another PDF form creator that is worth checking out. This software allows you to create interactive forms, as well as fill forms. Creating the PDF forms is easy. All you need to do is highlight the text fields, design how the data is set up, select text field types, and lastly, enter the data on the created text fields. Soda PDF also allows you to create PDF files from different file formats and later convert them to editable files. It also lets you edit text, modify pages, edit images, and add objects. 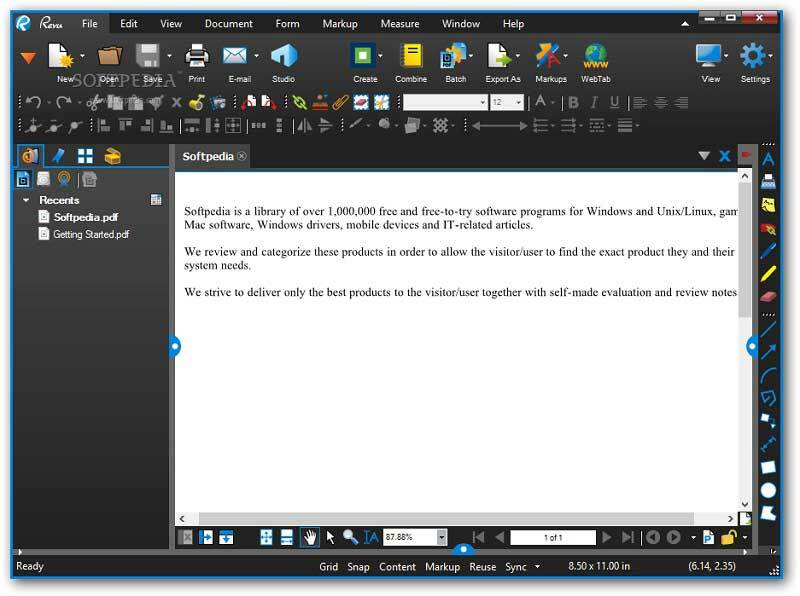 Soda PDF provides different markup tools that can be used to comment on your PDF file. Its pro version comes with an OCR functionality that allows you edit scanned PDF files. It also allows you to sign, lock, and unlock PDF files. 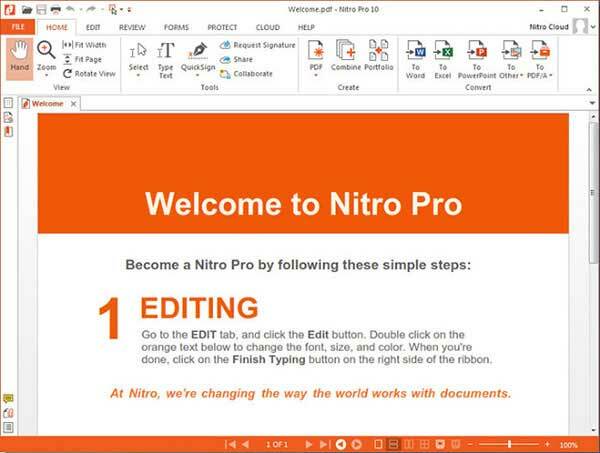 Nitro PDF is built with a PDF form creator. It has PDF creation elements like; checkbox, radio buttons, list box and combo boxes that enable you to create attractive and fillable forms. It is also a PDF form filler that allows you to edit text fields and also insert digital signatures. This PDF converter supports output formats like Excel, Word, PowerPoint, HTML, Images and more. It also secures PDFs with a password if you do not want unauthorized people to edit, copy or view its content. With this software, you can easily merge several PDF files into a single file. Bluebeam Revu is a great tool for creating PDF forms. This software allows you to create PDF forms using checkboxes, list boxes, radio buttons, and texts fields. Bluebeam's PDF forms are compatible with other PDF form fillers and have interactive form fields. 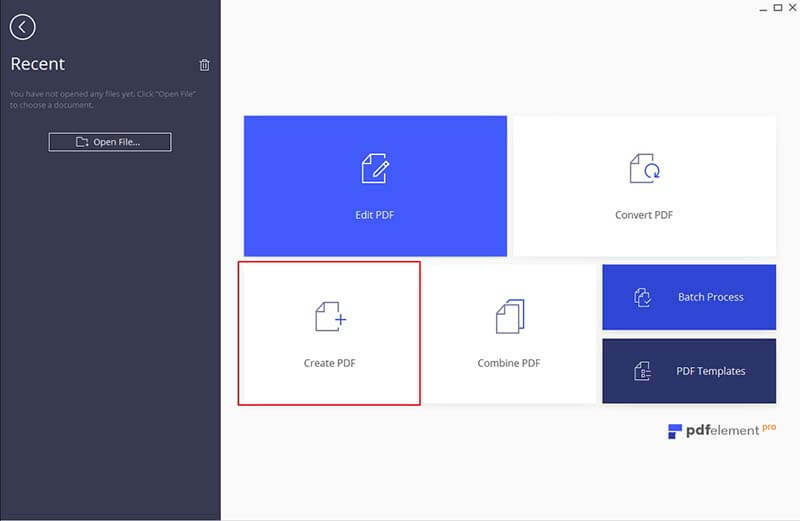 Furthermore, Bluebeam Revu is also a PDF creator that allows you to create PDF files from different sources. You can edit PDFs, add comments, organize, add sketches, insert markups, and customize exactly the way you want. It is also a reliable redaction software. If you have a scanned PDF file that you need to search text, or edit fields in, it's a breeze since Bluebeam Revu is equipped with OCR functionality. This PDF form creator also supports batch processing of files. 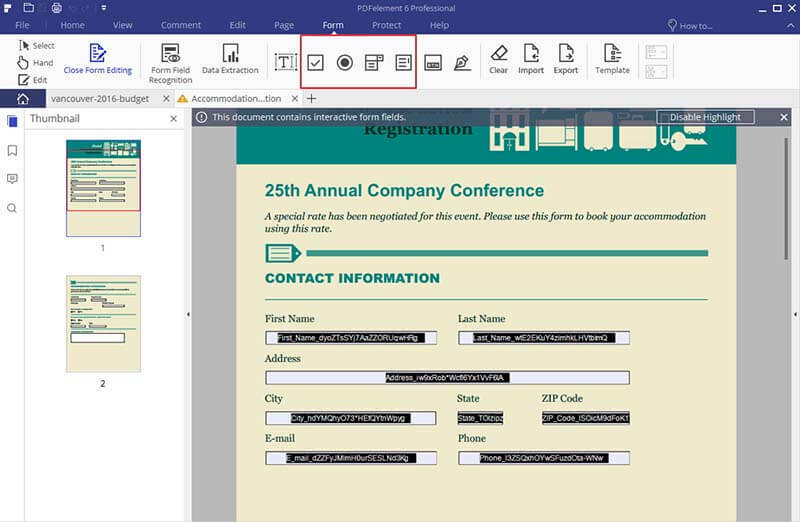 PDFelement is a comprehensive tool which enables you to easily create PDF forms in Windows. Not only can you create forms from templates, or create a personalized PDF form with text fields and buttons, but you can also fill in or edit your forms as you want with this amazing PDF form builder. In addition to offering great PDF creation tools, PDFelement also acts as a powerful PDF editor, allowing you to edit and convert PDFs without hassle. 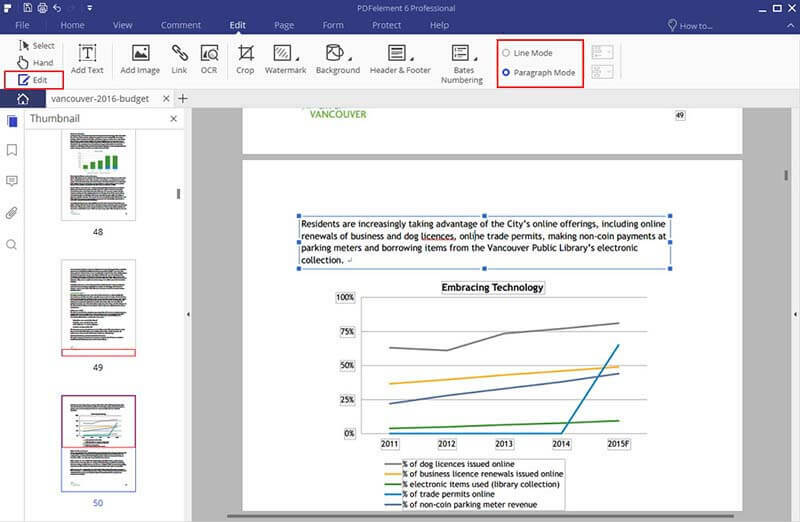 You can easily insert, delete and modify the texts, images and pages in your PDF, annotate your files with a variety of markup tools, or convert PDF to Word, Excel, PPT, Text and more. Enjoy the complete PDF solution with PDFelement.